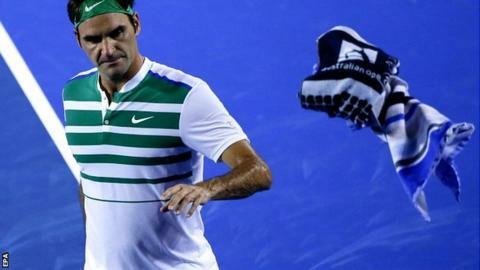 Roger Federer reached the last 16 at the Australian Open after proving too strong for Grigor Dimitrov in their highly-anticipated third-round match. The Swiss third seed's 300th Grand Slam match win was secured 6-4 3-6 6-1 6-4. Australian Nick Kyrgios was involved in an argument with an umpire as he lost 6-3 6-4 1-6 6-4 to Tomas Berdych. Top seeds Serena Williams and Novak Djokovic won in straight sets, while former champion Maria Sharapova also went through. Williams, of the United States, was in imperious form, taking just 45 minutes to beat 18-year-old Russian Darya Kasatkina 6-1 6-1. Serb Djokovic was not at his best against Italian Andreas Seppi, but won 6-1 7-5 7-6 (8-6), thanks in part to the Italian finding the net too often with his returns. Sharapova needed three sets to beat unseeded American Lauren Davis, the Russian fifth seed dominating the latter stages to win 6-1 6-7 (5-7) 6-0. Poland's number four seed Agnieszka Radwanska had a rather more straightforward day, beat Puerto Rican Monica Puig 6-4 6-0. The 34-year-old Swiss had won a tight battle against Dimitrov in Brisbane in the build-up to the Australian Open, but was a more comfortable winner on the bigger Grand Slam stage. Both men displayed the elegant shot-making for which they are known, but had Federer been more effective on break points in the second set, he might have won it in three sets. Federer failed to recover an early deficit in the second set and had converted only one of eight break points going into the third, only to step on the gas and leave Dimitrov in his wake. "Grigor was playing well and I thought I was struggling a little bit," said Federer, who plays Belgian David Goffin in round four. "It was an important start to the third set. Thankfully I got the early break and was able to stay in the lead." Kyrgios has rarely been far away from controversy at the Australian Open, having been fined for uttering an audible obscenity during his first-round win over Spain's Pablo Carreno Busta. He then had to leave the court during his second-round match against Uruguay's Pablo Cuevas because of a problem with his shorts. Against Berdych, Kyrgios launched into a rant at umpire James Keothavong, claiming that he could hear music from the stands, and that it was disrupting his game. The Australian, having lost the first two sets, took the third convincingly following the confrontation with Keothavong, but sixth seed Berdych came through to close out the match. It took two hours and 14 minutes for five-time Grand Slam champion Sharapova to see off Davis, the world number 103, and claim the 600th victory of her 15-year career. "Wow. I've won 600 matches?" said the 28-year-old. "Is this like a friendly reminder that I'm getting old? Might be." Sharapova next faces a tough test against 18-year-old Bencic, with the winner earning a potential quarter-final against Serena Williams. Bencic, coached by Melanie Molitor [mother of Martina Hingis], has won her last 15 three-set matches dating back to the 2015 French Open. Australia's Daria Gavrilova followed up her shock victory over two-time Wimbledon champion Petra Kvitova with a dramatic 6-4 4-6 11-9 win over Kristina Mladenovic of France. The 21-year-old, who beat three top-10 players in 2015, has made the fourth round for the first time and will face Spain's Carla Suarez Navarro next. "I'm just really excited and I want to hug the whole stadium," Gavrilova, the world number 39, said afterwards. Among the many matches postponed on a day of rain in Melbourne was the all-British doubles meeting between Johanna Konta and Heather Watson, and Jocelyn Rae and Anna Smith. With all four players in the GB Fed Cup squad, and team captain Judy Murray sure to be courtside, it could yet prove significant in terms of planning for next month's qualifier in Israel. The postponements mean a packed schedule on Saturday, with Konta up against Czech Denisa Allertova first on Hisense Arena at 00:00 GMT, and fellow British number one Andy Murray against Portugal's Joao Sousa first in the Margaret Court Arena night session at 08:00. For full details of our Australian Open coverage check out our listings page.